In this tutorial, we’re going to go through selecting and preparing our data to create these, before plotting the hull. We’ll then apply this to a for loop to chart each player together to see where a team is being forced to defend. 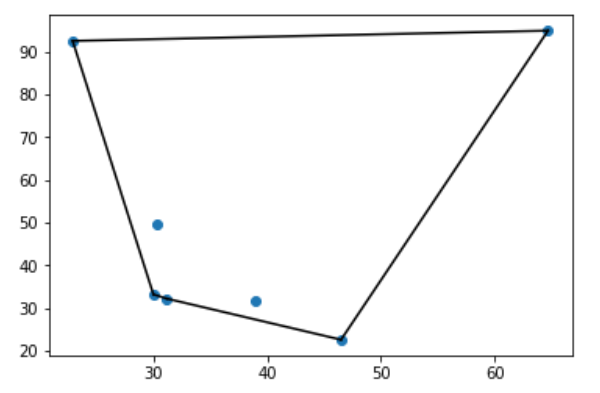 For this article, we’ll be making use of the ConvexHull tools within the Scipy module. The wider module is a phenomenal resource for more complex maths needs in Python, so give it a look if you’re interested. With the modules ready, we’re going to import our data. 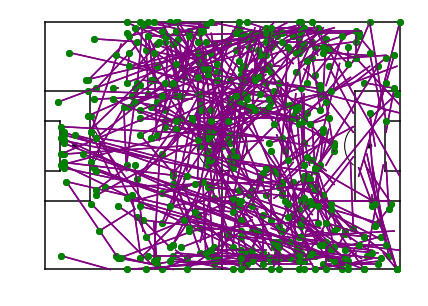 For this example, our data contains all defensive actions in one match, split by player and team. So each row is a defensive action, and we can see the x/y coordinates and who did it. See, that is pretty boring. 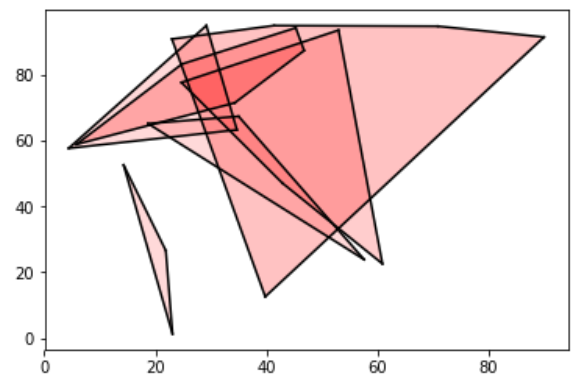 But we can make it so much cooler when we plot the hull onto a chart. Looks kind of abstract, but a lot more interesting than the hull object on its own! Perfect, we have one player’s zone of defensive actions plotted. We don’t have a pitch or any other players on there yet, but this is great work! Let’s work on a bigger project now – let’s do all of this over and over for a whole team. 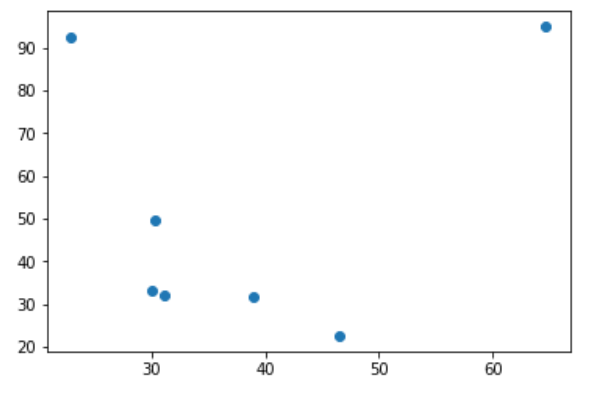 We’ll take a single team out of our dataset, then use for loops to create the plot for each player (exactly as above) before plotting them together. Perfect, just as before, but with different players on a single team. Fantastic work! We now have all of the players with enough data points on the chart. The transparency is a nice touch, as we can see any hidden players and where any crossover happens. Our plot leaves out any players with less than 2 defensive actions in the data, so you may want to plot these as lines or dots. If so, you should be able to figure out how to do this from the code already, or from our other visualisation tutorials. So now we can see where our team are performing their defensive actions – although remember a few players are missing. In terms of analysis, does this suggest that this team defends better on the left? Or is it more likely that they faced a team that largely attacked on that side? Visualisation is just one small piece of any analysis! 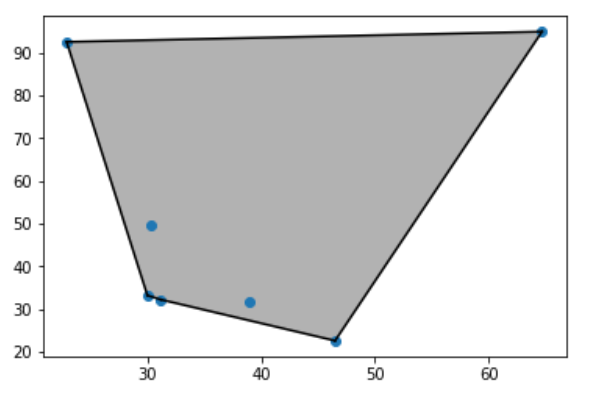 In this tutorial, we have practiced filtering a dataframe by player or team, then using SciPy’s convex hull tool to create the data for plotting the smallest area that contains our datapoints. Some nice extensions to this that you may want to play with include adding some annotations for player names, or changing colours for each player. 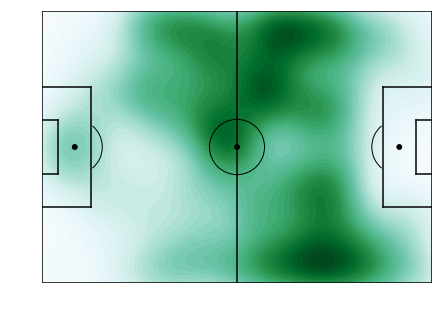 Of course, these charts aren’t limited to defensive metrics – why not take a look at penalty area entry pass zones, or compare goalkeeper distributions? However you build on this work, show us what you’re achieving on Twitter @FC_Python! Find further visualisation tutorials here! If you want to move past aggregate data on players and teams, you probably want to start looking at match event data. Obtaining this data can be difficult, and even when you get there, it is often in an XML file, rather than a table that you might be more comfortable with. This article will take you through parsing an Opta F24 XML file into a table containing the passes within a game. So here we have a hierarchy of team -> manager, with attributes within each data point such as team name or start date. Hopefully it is clear to see how this standardised method of sharing information might make it so much easier to use data in our work or share data with others – especially when data have different amounts of characteristics as we see above. Once we get through all of these steps, we’ll have a nice table with which we can do loads of plotting and analysis with! As a quick note, this Opta feed isn’t publicly available and is largely only found in clubs, analytics companies and media organisations. Manchester City and Opta briefly released a season’s worth of data from 2011-12, although FC Python unfortunately do not have this available. Follow along and import the modules below to get started! So we have a container for all the data, then a game that holds each event. Within each event, there are attributes telling us about the event as well as qualifiers giving even more information about each events. Awesome, we get loads of information about the match in a dictionary, where the data is laid out with a key, then the value. For example, we can see the team names and also their Opta IDs. Looking through this, there is a lot to try and get our heads around. We can see that there are event keys like min, sec, x and y – these are quite easy to understand. But the values, like outcome: 1 and event_id: 1, don’t really make much sense by themselves. This is particularly important when it comes to teams, as we only have their ID and not their name. We’ll tidy that up soon. This is because the Opta XML uses lots of IDs rather than names. You’ll need to find documentation from Opta (although versions of this can be Googled) to find out what all of them are. But first one’s free, and our event_id: 1 is pass – as you’d probably expect for the first event from the game. We don’t need to know what this means, but it is useful to understand the structure of the file as we will be going on to iterate through each event and qualifier to turn it into a table for further analysis. At its simplest, all we are going to do is loop through each of the events that we have identified above, identify the passes and take the details that we want from each. These details will go into different lists for different data categories (player, team, success, etc.). We will then put these lists into a table which is then ready for analysis, plotting or exporting. For this tutorial, we’re simply going to take the x/y locations of the pass origin and destination, the time of the pass, the team and whether or not it was successful. There’s so much more that we could take, such as the players, the pass length or any other details that you spot in the XML. If you’d like to pull those out too, doing so will make a great extension to this tutorial! The main part of the tutorial sees us going event-by-event and adding our desired details only when the event is a pass. To do this, we will use a for loop on each event, and when the event is a pass (id = 1), we will append the correct attribute to our lists created above. Some of these details are hidden in the qualifiers, so we’ll also iterate over those to get the information needed there. This tutorial probably isn’t the best place to go through the intricacies of the feed, so take a look at the docs if you’re interested. You can check out each list in more detail, but they should work just fine. So this is great for passes, and the same logic would apply for shots, fouls or even all events at the same time – just expand on the above with the relevant IDs from the Opta docs. And analysts, if you’re still struggling to get it done, the emergency loan window is always open! Passmap – full tutorial here. In this tutorial, we’ve learned a bit about XML structures and the Opta F24 XML specifically. We have seen how to import them into Python and parse them into empty lists. With these now-full lists, we have gone on to pull these into a single table. From here, it is much easier to run our analysis, plot data or do whatever else we like. The further beauty of this comes in automating your analysis for future games and giving yourself hours of time each week. Huge credit belongs to a number of sources that helped with this piece, including Imran Khan, FC R Stats and plenty of other posts that take a look at the feed. With your newfound data from the Opta F24 XML, why not practice your visualisation skills with the data? Check out our collection of visualisation tutorials here.